Australian Men’s Shed Association Executive Officer David Helmers joined AMSA Patron the Governor General Sir Peter Cosgrove and R U OK? earlier this week as the Conversation Convoy pulled into Canberra. R U OK?’s inaugural Conversation Convoy is a 14,000km road trip aimed at showing Australian communities everyone’s got what it takes to support those struggling with life. On Wednesday, the four car entourage pulled into Canberra on the final legs towards R U OK? Day on 14 September in Cairns (Queensland). The Conversation Convoy builds on the question “are you ok?” by reinforcing the four steps to a conversation, empowering Australians to ask, listen, encourage action and check in. Thanks to the Audi Foundation, the four yellow SUV’s each represent one of the conversation steps. “Sometimes the toughest of conversations happen within the walls of Men’s Sheds. It’s important to us as a national association to encourage shedders to feel comfortable to ask their mates: ‘are you ok?’,” said Mr Helmers. AMSA serves the Australian Men’s Shed community, driven by the aspiration to give all Australian men the opportunity to improve their health and wellbeing through participation in the Men’s Shed movement. “Supporting positive mental health and wellbeing outcomes in Men’s Sheds is a key priority for us, particularly with male suicide still at alarmingly high rates across the country,” said Mr Helmers. may be worried about. You can find your nearest Convoy stop at ruok.org.au. 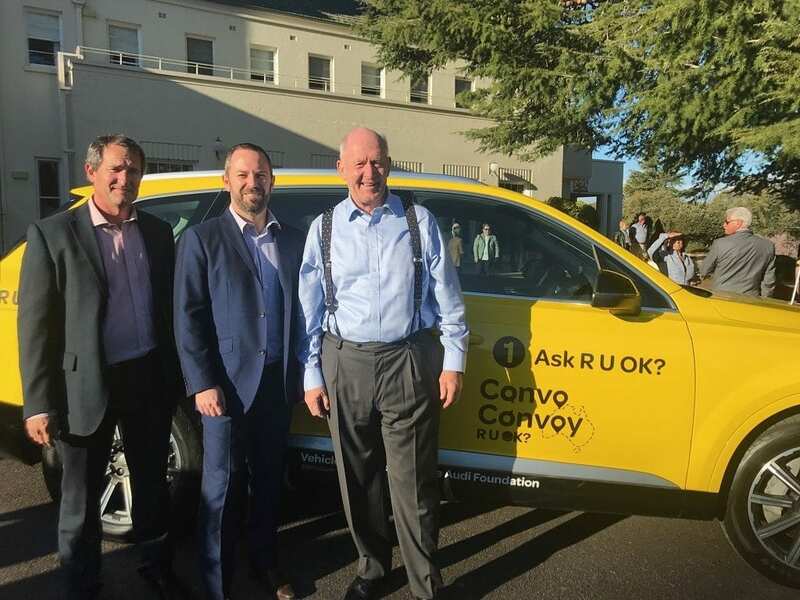 BELOW L TO R: David Helmers, Peter Chamberlain (The Chamberlain Foundation) and Governor General Sir Peter Cosgrove pose with one of the four Conversation Convoy vehicles.